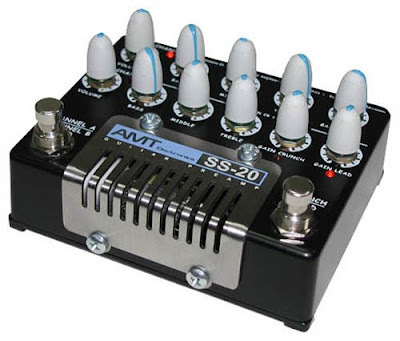 AMT ELECTRONICS SS-20 GUITAR PREAMP. - High-grade high-voltage feed of triodes. - Complete elimination of operational amplifiers traditionally used in hybrid preamps for sound amplification and processing. - Application of special semi-conductor amplifiers modeling triode-based harmonics and providing signal amplitude necessary for high-grade valve operation. 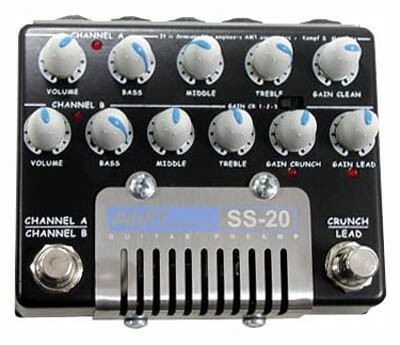 –Ttwo high-grade channels CLEAN and DRIVE with the possibility of Drive-channel operation in two basic modes: moderate sensitivity (CRUNCH) and high sensitivity (LEAD). – Effects Loop Send and Return. – Operation via both direct unaltered signal for guitar amplifiers heads, combos, and speakers (OUTPUT jack) as well as speaker cabinet compensated output for mixing consoles, computers, or other recording devices.